Injuries to this part of the body go by many different names depending on location and severity of injury: Achilles rupture, achilles tendinitis, achilles tendinosis, tennis leg, gastroc strain, soleus strain, the list goes on but I will refer to the rupture of a lower leg tissue generally as an achilles strain from here on out. The purpose of this post is to help the reader avoid ever having this injury by recognizing risk factors and developing skills that neutralize those risks. 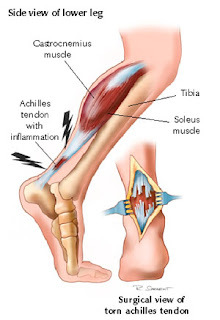 The achilles tendon is the largest and strongest tendon in the body. It can sustain a tensile load of 1 ton. That is the weight of a VW beetle. Despite it’s inherent strength, it remains the second most frequently torn tendon in the human body. The achilles is as substantial as it is because it is made to withstand the dynamic stress of an eccentric load. What that means is that when you jump and land on your toes, the gastrocnemius contracts to slow your heel from hitting the ground at the same time that it lengthens to accommodate dorsiflexion at the ankle. 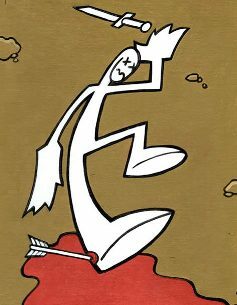 That makes the achilles tendon a rope in a powerful tug of war. When you gain strenth, weight, or increase work load rapidly, you run the risk of out pacing the relatively avascular tendon’s ability to adapt resulting in pulling it apart with your own body’s forces. Because of the inherent strength of this structure, it is unlikely for it to tear or rupture when it is healthy. It is far more common for a previously inflamed gastroc-achillis complex to give way to a major tear. This is a peculiar tissue that runs when it is torn, much like a piece of paper with a small tear in it- pull on both ends and you’ll soon have two pieces of paper. Athletes are used to performing through discomfort and pain and rarely take the necessary steps required to avoid an impending tear. Most of the successful athletes that I know don’t “listen to their bodies.” They have another chain of command where their bodies do as they are told. That being said, have a look at the wrecked tendon below. This is what was left of my older brother’s achilles after he blew it out in a basketball game. He played through the pain. He went to the gym the next day! He didn’t get in to have it looked at for 3 days. I love him, but he’s a big dumb animal. Don’t be a big dumb animal. There are 3 major ways that you may be vulnerable to an achilles injury right now. Are you an athlete between the age of 25 and 40? Have you recently gained weight or increased your strength? Do you like to train cold? Take off from a stop to a sprint? Do you do workouts with rapid repetitive jumps? Do you frequently run on the road? Are you experimenting with barefoot running? Are you sore and tight above your heel when you first wake up in the morning? Does it wear off as the day goes on? Have you noticed any swelling making one calf muscle appear larger than the other? Remember it doesn’t have to be painful. Have you noticed a “twang” in that area. The day after a REALLY long run I felt the sensation of guitar strings being strummed in my achilles followed by them being cut one by one. I iced it and steered clear of dynamic training for a week. Listen to your body- I know. You don’t want to but when your body speaks from your lower leg you listen. When your lower leg hurts even a little, ice it and give it space. Warm the area. I don’t mean “warm up.” Waving your arms and crunching your core won’t warm your achilles tendons. Use the muscle before you stress it and for God’s sake don’t warm up with double jumps or you’re asking for trouble. Make gradual progressions- The 10% rule is a conservative way of extending your distances by 10% per outing. Train on diverse surfaces- Consistently running forward on pavement will overwork the mid line structures of your lower leg. If you are experimenting with the idea of bare foot running, do it step by step- Losing the heel you’ve had you’re entire adult life places an additional 1/2 inch stress on your achilles/gastrosoleus junction. Keep in mind that the gastroc is part of a larger fascial plane that runs from the bottom of your foot to the origin of your hamstring at your ischial tuberosity. Maintain global range of motion all the way to the toe by working a ball into the base of the foot while you are at your desk. All- you feel like you’ve been kicked, hit, or shot in the back of the calf. You will probably even turn around to see who did it. It may hurt a lot as in a 1st or 2nd degree tear, or it may only hurt a little as with a total rupture which can be less painful due to the nerve damage. Either way, it will probably swell and a palpable lesion may be present. Tape your ankle into plantar flexion and get to a sports medicine doc as soon as possible. Do Not Stretch It. Nothing- This is the small lesion or inflammation that later leads to “All” as described above. With a chronic presentation of lasting discomfort in the lower leg, fascial adhesions are likely built up between the muscle and the fascia. The soft tissue modalities of ART and Graston Technique (tools pictured below) are the methods of choice for releasing those adhesions before they cause larger problems. With an acute onset PRICE is the rule here: Protect, Rest, Ice, Compression, Elevate. Remember that the P in protect may require you to Protect your lower leg from your ego and whatever achilles busting plans you had for it when you woke up this morning. The initial injury/tendonosis that precedes the rupture may be totally pain free. I had a patient last month with a slightly swollen lower leg. It was painless but I kept her away from dynamic training for a week just the same. Your point about the post injury impingement highlights the importance of sub-acute care with ART or Graston.